OK, This is an old friend of mine (old as in I knew him, but haven't seen him for years), "Wildman" Steve Brill. 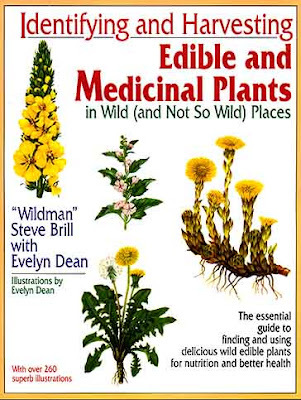 Steve is an expert in wild edible and medicinal plants. 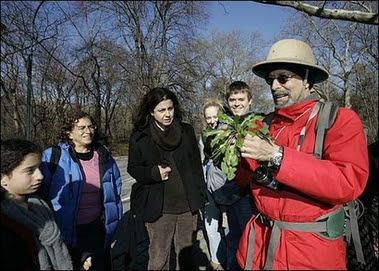 He leads tours through the different parks in New York City, showing people how to identify the edible and medicinal plants that grow there. Steve is quite a character, and a lot of fun to spend an afternoon with, foraging through the wilds of NYC. He taught me a lot. Not only how to find the plants, but how to prepare and cook them, or use them for medicine, and how to go mushroom hunting and find some of the most delicious mushrooms on the planet. Thanks to Steve, I lived a mostly vegetarian diet for a year, eating just what I could find on my hikes through the woods, hills, lake sides, and seashore. Not only did he teach me, but I also taught him a few things myself. I acted as his assistant for a couple of private tours. We told the one tour that after the tour is over, you provide the entree, and we'll provide the salad. When the tour was over, they asked where the salad was, so we took a couple of plastic bags, and ran off into the woods like- well- wildmen, and 10 minutes later came back with all the ingredients for a mighty fine salad. There was an opening for a Botanist/Naturalist with the New York City Parks Department, and Steve wrote me a letter of recommendation. I didn't get the job, or even an interview. At the time, Henry Stern and his guys in the parks department thought of Steve as some sort of eccentric moron who was trying to eat Central Park. Okay, I'll admit, he might be a bit eccentric, but he certainly isn't a moron! After Henry Stern some Manhattan socialite was put in charge of the Parks Department, and was horrified at what Steve was doing. She was worried that people might pick something that a dog had just pissed on, and get sick. Steve contacted the CDC, and they assured him that you were more likely to get killed by a mugger, than get sick from eating a dandelion. Unfortunately, I fell out of touch a number of years ago with Steve. I saw this article on the Yahoo! homepage, and it brought back some fond memories of days gone by. So I searched through Google to see what Steve's been up to. He got married, (but not to Evelyn), and has a baby girl now. Way to go Steve! It's great to see someone you knew and liked way back when doing well. I wish you and your family many years of happiness, Wildman!